Brittany Welsh is a middle blocker for the Women of Troy. A homegrown product of SoCal, the senior is living out her dreams. The screams coming from the Galen Center practice courts are loud and sharp. Making sure that the ball stays alive and in play is half the battle. For the Women of Troy, defense and repetition are verbally drilled into their core philosophy. The No. 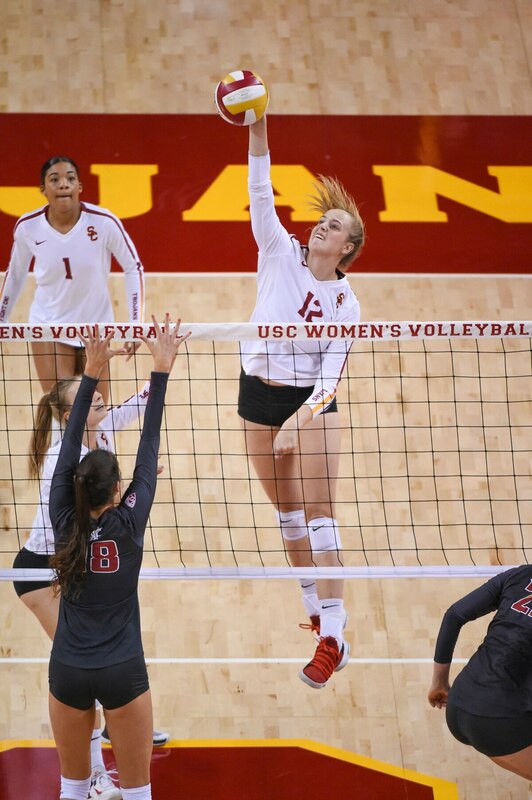 13 ranked Southern California volleyball team is preparing for this weeks matches against No. 25 Washington and No. 19 Washington State. Senior middle blocker Brittany Welsh is watching intensely from the sideline. She knows that preparation is key in defending home court. Welsh and her teammates are constantly talking, yelling, communicating, and ensuring players are in the right position and knowing when to rotate. When she subs in, Welsh stands dead center, right in front of the net, ready to lead. "Volleyball is kind of like a dance," Welsh explains. The 6-foot-4 anchor on defense has been playing the sport since the age 12. It wasn't always easy, yet there was an instant love connection. "I was always the awkward Bambi type from 6th grade to senior year of high school," Welsh said. "Basically I was growing so fast. My body took time to adjust but it was great." Growing up in Newport Beach, California, athletics came naturally to Welsh. Her parents insisted their daughter would be tall – once she grew up. "It was either basketball or volleyball from a young age," she said. "As I got taller, I loved volleyball even more." Before graduating from nearby Mater Dei High School in 2015, she led her team to the regional finals of the state championships. The school is famed for its incredible sports alumni. The Monarchs have produced USC standouts Matt Leinert, Matt Barkley and current true freshman quarterback JT Daniels. The Welsh family is an athletic bunch. Her older brother Charlie sails for Boston University and younger sister Becca is a high school senior playing volleyball as well. "LSU reached out to me so I went on a visit and fell in love with the culture," she said. "My mom went to USC and my dad went to UCLA, so I'm used to big athletic programs. I decided to get out of the state." Playing for a nationally ranked program provided a quality experience. But then…"I got homesick and moved back," Welsh said. Since then, her parents have been to every home game. Though she made the choice way back between basketball and volleyball, the reality of big-time college volleyball is that – just like college basketball – it is a sneaker game, and the SC women's volleyball team is outfitted with Nike shoes. During practice, Welsh is spotted in the 'Red Velvet' Kevin Durant 10 model. This is only logical. Her sport is played on the same hardwood surface as NBA professionals, thus many on the team prefer to wear basketball kicks. "I saw them on Twitter when they came out last year," Welsh gushed. "…And I was like, 'Oh my gosh. I need them, I love them.'" "The shoes we get are cool and comfortable but I like more flexibility and support," she said. "Our sport has similar movements as basketball so a lot of the girls wear the basketball kind." The 2018 women's volleyball team, under the leadership of new head coach Brent Crouch, has rejuvenated the program: ranked as high as No. 7 in the country this season. The team found early success with a trip to Florida for the Bubly Invitational. The team left with impressive wins over Louisville and the University of Florida. After being eliminated by the Gators last year in the NCAA tournament, payback was sweet. "The team has really vibed this season and the atmosphere has been fun," Welsh admitted. As for her commitment to the team, Crouch admires the senior's leadership role. "She hasn't played much on the court this year, she hasn't been able to set an example on the court a ton," Crouch said. "What she has set an example of, is how to be a total pro." "For a young person to see a senior not start, going to practice and working hard all the time, she's been an absolute professional and young people need to see that." On providing guidance to the new Women of Troy she said, "Coming in as a freshman is already nerve-racking enough. It makes me happy now because we're building chemistry for the team and hopefully they can do the same for the next generation." When Welsh came to USC, she started her academic career as a non-governmental studies major. 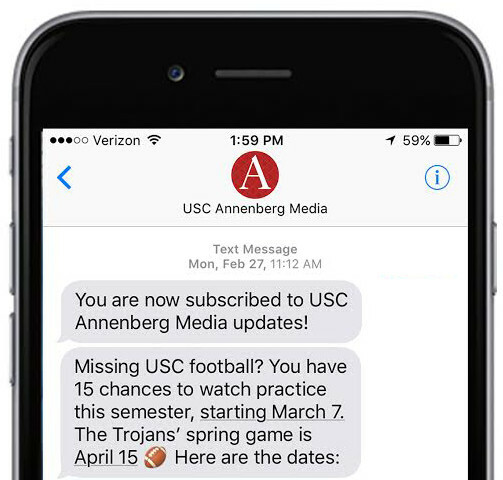 Her passion for sports media led her to switch gears and she is now enrolled at the Annenberg School for Communication and Journalism where she is studying communications. She loves class life and the professors teaching her sports ethics. Balancing time between the classroom and the hardwood seems to be the biggest challenge. "It definitely took a lot of learning, it's really important to get the homework done early," she said. "Like coach says 'Be early, do early.'" How far can this team go in the NCAA tournament? "Right now, as a team, we're playing in the Pac-12, a tough conference," Welsh said. "We've been putting up good numbers against these teams. There's been improvement during the season. Come tournament time, I feel like we'll make a really good run." The women of Troy are currently 18-7 and hope to sweep this weekend as they take on Washington on Thursday at 8 pm and Washington State on Sunday at 1:30 pm. To win it all Welsh and her teammates must defend their home court and continue digging.